Dentist Indianapolis: Learn Why You May Need Dentures Here! Taking care of your oral health is an important task that you must perform every day. Brushing your teeth, flossing, using mouthwash and seeing your local dentist are the best ways to take care of your teeth. We at McCall Dentures in Indianapolis, want you to have your teeth looking clean and sparkling all the time. Sometimes, though, we need to utilize implants or even dentures to make this happen. uld possibly lead to dentures. Also, things like gum disease and tooth decay are something that we will be on the lookout for. If we think your oral health is in jeopardy, we may recommend you for some comfortable dentures. If your gums are swollen, bleeding, very tender, or red, this may possibly be a sign of gingivitis, a more severe disease attacking your gums which impacts your teeth. This can be prevented though, as long as you are thoroughly brushing and completing your oral care regimen at home. If it is too severe, we may recommend that dentures are the best option for you. In adolescence, braces will fix this issue and they will correct gaping, shifting, or loose teeth. When you are into adulthood and this is happening, this may be a bigger issue. Gum disease may be to blame for the shifting of your mouth because the disease is causing bone loss to occur. 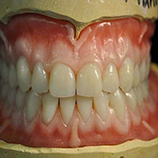 If gum disease has progressed this far, it might be time to consider some dentures. 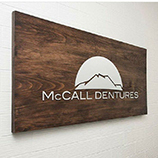 If you have already begun to lose some teeth, it is important to see McCall Dentures in Indianapolis as soon as you can. You may think this isn’t a huge cause for concern, but when you lose even one or two teeth, this means the others have to work much harder and sometimes they can’t take the pressure. This creates a domino-like effect where they will just keep falling out. If this is happening to you, dentures may be the best thing to help your oral care. 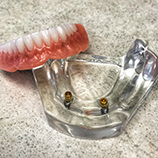 Dentures may sound like a scary solution, but we at McCall Dentures in Indianapolis, will take good care of you and let you know all your options for a treatment plan. We want to make sure you are taking care of your oral health, and have the smile you deserve. If you feel any of these scenarios apply to you, call us and we can help! Check back for our next blog: Why dentures are beneficial to you!